Advantages of Agile model ? Customer satisfaction by rapid, continuous delivery of useful software. People and interactions are emphasized rather than process and tools. Customers, developers and testers constantly interact with each other. Working software is delivered frequently (weeks rather than months). Close, daily cooperation between business people and developers. Regular adaptation to changing circumstances. The traditional waterfall methodology for software development is rapidly losing its popularity as Agile methodology is now being increasingly adopted by companies worldwide for software development. Waterfall basically is a sequential model where software development is segregated into a sequence of pre -defined phases – including feasibility, planning, design, build, test, production, and support. On the other hand, Agile development methodology follows a linear sequential approach while providing flexibility for changing project requirements, as they occur. Agile SDLC model is a combination of iterative and incremental process models with focus on process adaptability and customer satisfaction by rapid delivery of working software product. Agile Methods break the product into small incremental builds. These builds are provided in iterations. Each iteration typically lasts from about one to three weeks. Every iteration involves cross functional teams working simultaneously on various areas like planning, requirements analysis, design, coding, unit testing, and acceptance testing. At the end of the iteration a working product is displayed to the customer and important stakeholders. Agile model believes that every project needs to be handled differently and the existing methods need to be tailored to best suit the project requirements. In agile the tasks are divided to time boxes (small time frames) to deliver specific features for a release. 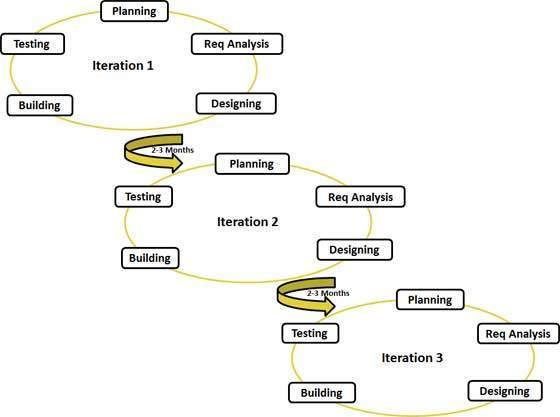 Iterative approach is taken and working software build is delivered after each iteration. Each build is incremental in terms of features; the final build holds all the features required by the customer. Agile thought process had started early in the software development and started becoming popular with time due to its flexibility and adaptability. The most popular agile methods include Rational Unified Process (1994), Scrum (1995), Crystal Clear, Extreme Programming (1996), Adaptive Software Development, Feature Driven Development, and Dynamic Systems Development Method (DSDM) (1995). These are now collectively referred to as agile methodologies, after the Agile Manifesto was published in 2001. · Individuals and interactions - in agile development, self-organization and motivation are important, as are interactions like co-location and pair programming. · Working software - Demo working software is considered the best means of communication with the customer to understand their requirement, instead of just depending on documentation. · Customer collaboration - As the requirements cannot be gathered completely in the beginning of the project due to various factors, continuous customer interaction is very important to get proper product requirements. · Responding to change - agile development is focused on quick responses to change and continuous development. 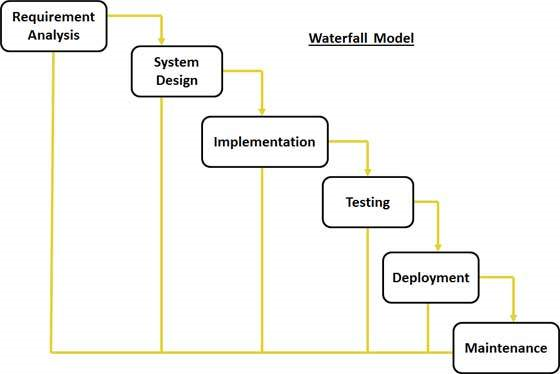 What is Waterfall Model design? Waterfall approach was first SDLC Model to be used widely in Software Engineering to ensure success of the project. In "The Waterfall" approach, the whole process of software development is divided into separate phases. In Waterfall model, typically, the outcome of one phase acts as the input for the next phase sequentially. Following is a diagrammatic representation of different phases of waterfall model. · Requirement Gathering and analysis: All possible requirements of the system to be developed are captured in this phase and documented in a requirement specification doc. · System Design: The requirement specifications from first phase are studied in this phase and system design is prepared. System Design helps in specifying hardware and system requirements and also helps in defining overall system architecture. · Implementation: With inputs from system design, the system is first developed in small programs called units, which are integrated in the next phase. Each unit is developed and tested for its functionality which is referred to as Unit Testing. · Integration and Testing: All the units developed in the implementation phase are integrated into a system after testing of each unit. Post integration the entire system is tested for any faults and failures. · Deployment of system: Once the functional and non functional testing is done, the product is deployed in the customer environment or released into the market. · Maintenance: There are some issues which come up in the client environment. To fix those issues patches are released. Also to enhance the product some better versions are released. Maintenance is done to deliver these changes in the customer environment. All these phases are cascaded to each other in which progress is seen as flowing steadily downwards (like a waterfall) through the phases. The next phase is started only after the defined set of goals are achieved for previous phase and it is signed off, so the name "Waterfall Model". In this model phases do not overlap. · Requirements are very well documented, clear and fixed. · Product definition is stable. · Technology is understood and is not dynamic. · There are no ambiguous requirements. · Ample resources with required expertise are available to support the product. · The project is short.